Is there room for an addition? For example, is your yard large enough to accommodate an addition to your home? What are you missing in your home? How will this new space meet your family’s needs? How feasible is it to make the changes you’d like to make? Would you need to make significant changes to your home in order to do so? What are you comfortable spending on this project? 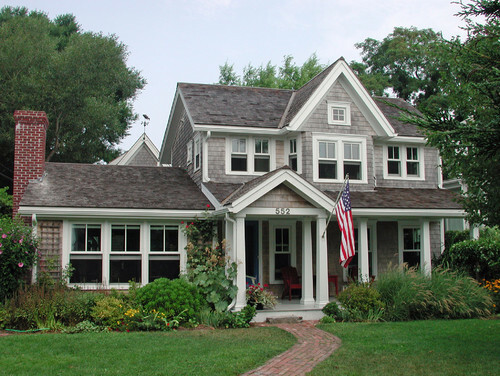 Traditional Exterior by Charlotte General Contractors Advanced Renovations, Inc. The general consensus is that ground floors are a simpler project. Most additions involve adding to the ground floor of a home. Your contractor will add a new slab of foundation and build up the walls from there, which will ultimately be attached to your existing home. Building up means that there is already foundation in place, and it is important that the existing foundation and footings are strong enough to hold a second story. You can add another story onto a one- or two-story home, or expand an existing top floor by installing large dormers in a pitched roof to gain useful living space. You may also add living space above an existing garage, porch, sunroom or other one-story wing. Tends to be more costly. It’s important to take note that if you decide on a second story addition, your roof will be removed and you may need to find temporary place to stay outside your home. There may also be greater risk of damage to the rest of your house (e.g., ceilings and floors on the ground floor). Like any project, it’s important to keep in mind what goals you have for your new space(s). There are many reasons to build up or out depending on your home and family’s needs.